Don Gillum (above) was a valued GHT volunteer and a respected and well-known member of the eastern Vilas County community. 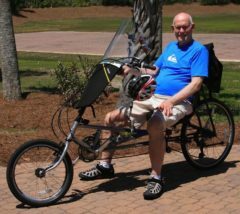 The Don Gillum Memorial Bike and Hike coming up next summer will honor his memory and celebrate the developing Conover-Phelps Trail. The July 21 family-oriented event will start in Conover’s Community Park and give all participants a chance to walk or cycle a part of or all of the new trail. The event will include the dedication of a bench in Don’s memory, and a healthy lunch and drawings for door prizes including a child’s bicycle. GHT is working with the Relay for Life of the Northwoods to put on the event. Rollie Alger and Joy Turpin are co-event directors. More details to come in 2018!